The Farmer’s Market can be an odd beast in winter. It seems impossible that five stands could succeed selling nothing but oranges, yet there they are, week after week, with 5 and 10 pound sacks of citrus. Some do buck the trend, selling only apples, for example, another common fruit which is, perhaps, under-represented at the market. Still others carve out more unique positions, like Frank Stenzel’s all Kiwi table. 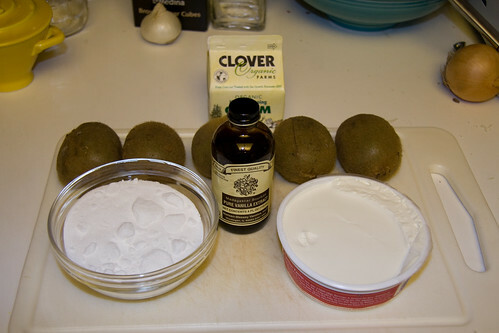 There is much to admire in the humble kiwi—which is actually a berry, not a fruit—the hairy skin, the lustrous green flesh, the myriad seeds surrounding the white center like an inverted cat’s eye. Of course there is also the flavor. Slightly tart and sweet. Smooth and never cloying. Distinct but accessible. 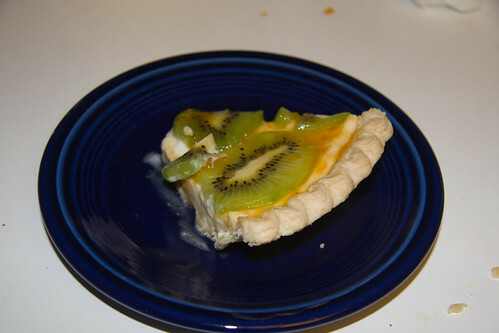 I would be content to eat kiwis plain, but the rules of this project demand that I prepare each food, and so it was, under duress, that we made a tasty kiwi tart. 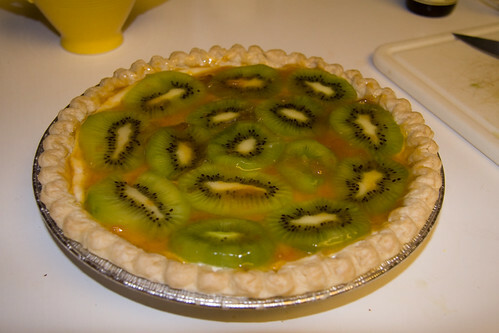 This excellent recipe calls for a filling of cream cheese, sugar, vanilla and cream, topped with sliced kiwi and a glaze made from apricot preserves, a roll-call of many of my favorite flavors. Given instructions this simple and beguiling—”Combine cream cheese, sugar, vanilla, and cream until smooth.”—there was no need to improvise or interfere. We mixed up two L’Ã‰tranger cocktails, followed the directions, chilled the tart for an hour or so, and attacked. Two hours may have been a more appropriate chilling time, as the center of our tart had a little trouble holding up when sliced, but honestly, I ate my piece so quickly, I hardly noticed. The most challenging part was pausing to take the photos.